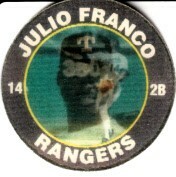 1991 7-11 Slurpee disc of former Texas Rangers star Julio Franco. MINT. ONLY ONE AVAILABLE FOR SALE.